Lead-free, lightweight high-velocity pellet with exceptional accuracy for competition and hunting. Supersonic and with very flat trajectory for medium ranges. 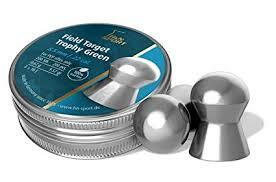 No lead-fouling, improved drive in the barrel, no contact with lead thanks to special tin alloy. Smooth. High impact and tight shot groups. Smooth.